The problem with the infinite potential of technology is it’s very hard to tell a good, world-embettering idea from the terrible, awful, terrible ideas. For example “a dating site that’s also a cookbook — for food lovers!” might be a fun thing, but “a dating site that’s also a cookbook — for cannibals!” is for some reason “too disruptive” for the current dating scene. But the two are so similar! Let’s examine another such bad idea: Tenant Assured bills itself as being able to deliver “[i]nsightful referencing like never before”. 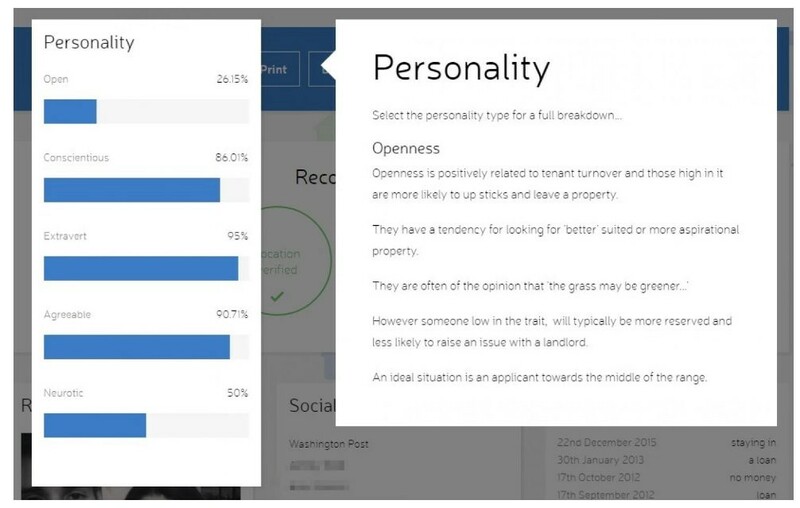 Their report goes deeper than just credit checks, they connect to tenants’ social media accounts to derive a deeper insight into your tenants’ social networks and personalities. You might say “that’s creepy” or “that’s obvious pseudoscience” — but they would say they’re selling peace of mind. I’ve written before about how even industry giants are very bad at using the data you’ve given them to predict your future moves (while the industry as a whole is very keen to tell you they’ve invented mind-reading magic). It’s an attractive idea that there must be something to be done with the huge amounts of info put online about themselves — but I’m very suspicious about any service that claims to do anything as useful as predict a person’s future risk based off Instagram. Just look at that! It might as well have asked you your star sign: “Taurus are reliable tenants (but make sure they pay for a cleaner at the end! ),but if you’re going to rent to Leo — get a guarantor”. It would be funny if this wasn’t a service that aims to help decide if someone does or doesn’t deserve a place to live. Trying to reassure about the invasive nature of the business Thornhill says a terrifying thing: “If you’re living a normal life then, frankly, you have nothing to worry about” — aside the base level concern that statement should draw, it reflects a classic tech culture assumption about “normal”. One of the things their sample report highlights is pregnancy dates — possibly being pregnant is of course a perfectly “normal” part of life for half the population (and as such is legally protected). Thornhill says that “[i]t’s up to landlords to do the right thing” — but if you’re going to decline someone for legally allowed reasons, you absolutely should not know any reason you might have for illegally excluding them. This is a ridiculously neat paper trail for when landlords start getting sued. But thinking back on a previous almost-landlord, they’re probably not wrong about there being a market here! After we passed our reference details to the letting agent, they got in touch saying that the landlord wanted to see our bank statements. We were surprised by this but it turns out statement checks are a thing. In fact you can find posts on landlord forums where some say they insist on it — they’re taking the risk letting out the house you understand. I never feel much sympathy for this defence: the “risk” of the landlord is a privilege of making money off owning property — they’re welcome not to. The risk to tenants of substandard housing, irresponsible landlords and insecure living can’t be avoided nearly as easily. This particular landlord then wanted to meet to interview us personally. Fair enough you might say — but this guy! Man, we walked out of that meeting certain that we don’t want to have any kind of personal or professional relationship. But Tenant Assured would spent 10 seconds with him and go — hey wow! The perfect customer! If they don’t have a composite sketch of the guy under their “creepy landlord” marketing persona they are missing a trick. But if you can’t beat ’em join them! If there’s money to be made offering pseudoscience to creepy people, who am I to pass it up? So I am proud to announce Use Your Head Referencing — a common sense solution to the referencing problem. No need to depend on tenants having social media accounts — our system is more universal! Here’s how it works: tenants upload “selfies” to our system — we then use our patented algorithms to perform a neo-phrenological analysis of the tenant. In layman’s terms, we create a model of the shape of their skull and analyse this information to determine if they have any degenerate or criminal tendencies. For a second data point we also perform a astrological investigation of a tenant’s personality to check for any red flags. Tenants might complain about having their future judged this way — but can you afford to take the risk we’re wrong? We eagerly await your business.